Western blot analysis of extracts from A431 cells, untreated or pervanadate-treated (1 mM for 15 minutes), using Non-phospho-Src (Tyr527) Antibody (upper) or v-Src antibody (lower). 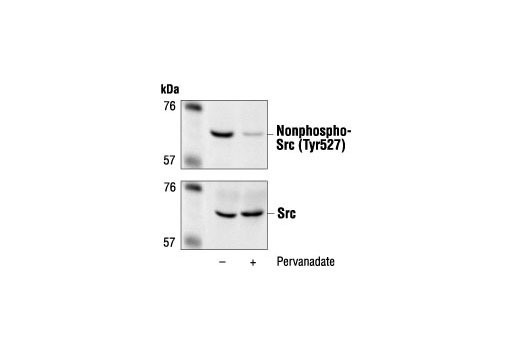 Non-phospho-Src (Tyr527) Antibody detects endogenous levels of Src only when dephosphorylated at tyrosine 527. It may also cross-react with Yes, Fyn and Slk based on sequence similarity. Polyclonal antibodies are produced by immunizing animals with a synthetic peptide corresponding to residues surrounding Tyr530 of human Src. Antibodies are purified by protein A and peptide affinity chromatography.